My return to a focus on material was timely, as this week was the first in a series of Leverhulme institutes by visiting professor Carolyn Christov-Bakargiev, which was all about matter. Professor Christov-Bakargiev was named the most influential person in the artworld in 2012 by Art Review’s Power Top 100, and has held prestigious posts including Artistic Director of the 16th Biennale of Sydney in 2008, as well as working as a Senior Curator at P.S. 1 Contemporary Art Center in New York from 1991-2001. The focus of the Leverhulme seminars and institutes centred on themes which emerged as part of her most recent appointment, that of Director of documenta 13 in Kassel, Germany. The topics addressed included: art as research, ethics of curatorial studies and practice, and the relations between temporality, space and embodiment. The documenta festival takes place every 5 years, with a 4 year research and preparation period culminating in a 100 day arts festival. Beginning in 1955, after a period of post-War re-evaluation, Kassel staged the festival in an attempt to “reconcile German public life with international modernity and also confront it with its own failed Enlightenment”. Since the fifth documenta in (1972), each festival has been directed by a different curator to produce a whole new idea of how international art links can be developed. The first exhibitions in 1955 were an attempt to re-present and redress previous claims made by the Nazis about Modernist art as ‘degenerate’. Led by Arnold Bode and Werner Haftmann, the festival was dubbed the ‘Museum of 100 days’ which still serves as inspiration for curators to this day. Throughout the history of documenta, themes have included the questioning of reality through images, the ‘Neuen Wilden’ and the historical and social dimensions of art. The Leverhulme series began with an evening lecture exploring a virtual journey through the psychological map of curatorial practice behind documenta 13. In an article on the Walker Art Center website, Christov-Bakargiev is quoted as stating that “documenta (13) is dedicated to artistic research and forms of imagination that explore commitment, matter, things, embodiment, and active living in connection with, yet not subordinated to, theory”, leading to her exploration of such diverse practices as quantum physics, activism, and philosophy, in the context of art research. Christov-Bakargiev’s vision was to create a festival that was intentionally unharmonic. Despite the fact that the 2012 documenta was spread across 4 different countries simultaneously, participants were not encouraged to feel in sync with other venues and cities, to add to their sense of displacedness. * Exploring both physical and psychological geography, the themes of Siege, Hope, Retreat, and Stage metaphorically represented the four physical locations of the festival: Afghanistan (Kabul and Bamiyan), Egypt (Cairo), Canada (Banff) and Germany (Kassel), respectively. However, the connections between these places and states were intended to continually shift throughout the exhibition, disrupting audiences perceptions of each location. documenta (13) was categorised by its constant deferring (différance) of the meanings between locations and objects. Through reference materials such as the 100 Notes – 100 Thoughts that underpinned the making of the exhibition, audiences were passed between thought and process. Central to this was the hub of the Kassel exhibition, entitled the ‘Brain’. Consisting of an archive of objects, artworks and documents, presented with equal value, each artefact referenced another work in the city, acting as a sort of key and creating further complex meanings and associations. This complexity was highlighted in the guide book for the ‘Brain’, the specially commissioned artwork ‘For when all that was read… so as not to be unknown’ created by Judith Barry. 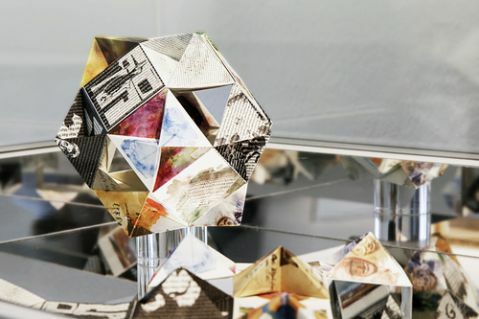 Consisting of a printed poster that could be folded and constructed into a 3D modular origami model by the reader, the work existed as a both a document of the exhibition and an artist book. Producing the guide in this non-linear fashion also aimed to convey the central theme of the festival, one of shifting hierarchies and perspectives. *Paradoxically, this could also be a factor in increasing site-specific-responsiveness, not only by practitioners but also audiences. After my work with flexagons I decided to focus a bit more on paper based structures that I could incorporate into my book objects. I began by conducting a library search for related terms, which included paper folding, paper craft, origami, etc, fully expecting them to turn up within the art section of the library. However, my discoveries actually revealed much more about the way that I was approaching my work than I’d realised. In fact, most of the books related to paper were classified under textiles, with a few veering into mathematics. This realisation of paper as material rather than concept or conduit for ideas, highlighted my previous neglect of paper as prima materia in my work. Although the conceptual elements are important to me and to the work, they in fact stem from the associations created by and through the material and it was a good reminder to work out from the material rather than merely applying theories and concepts to it, or using it as a support for the image/text. Ideas about paper as material and concept are the subject of a number of artists work and these thoughts reminded me of an exhibition I’d seen at Manchester Art Gallery back in 2012. The First Cut exhibition took the medium of paper and its associations as a point of departure, in order to explore the ways in which artists create works from this traditionally ephemeral material. Mixing big name artists such as Kara Walker, Peter Callesen and Rob Ryan, with local talent, Andrew Singleton and Nicola Dale, the show explored themes relating to the different uses of paper in art and society. Beginning with the theme Imaginary Worlds, artists created works that explored the architecture of the gallery space as well as creating new environments through the use of installation. 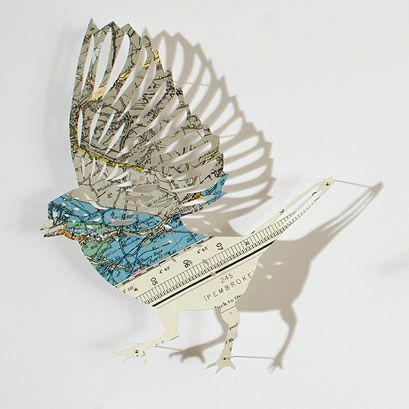 Exploring concepts of time, motion, engineering, consumerism, environmentalism, nature and artifice, artists produced a range of works including papercuts, sculpture and kinetic art. Following this, the Off the Page section referenced both the book as source material for the found paper used in the works, as well as the possibilities for books to be increasingly usurped by digital technologies. * Artists transformed books such as encyclopaedias, pulp fiction, classic literature, artist’s monographs, and pornographic magazines in order to create new works of art. Finally, Mapping new Territories explored not only geographical boundaries, but also the histories and currencies associated with those places. As well as re-using and creating maps of real and imagined places, the works also depicted the violence of colonialism and global politics through the use of cut paper silhouettes of slavers and origami guns made from dollar bills. The use of paper in artworks, particularly large-scale installation, often seems to create genuine wonder for the dexterity and patience of the artist. It is also a possibility that this sort of reaction is exacerbated by the fragility or (lack of) longevity of the material. Could this be something that I could build into my books or would it make people too nervous about damaging them? *This issue seems to come up a lot in debates around books and book art. However, I feel that the relationship between the use of books and the use of the internet and digital is usually only connected through written content, (and even then creates a different user experience). Therefore, each medium has unique abilities with which to supplement the other.